Released in 2008 by the UK-based Modern Art under their label S. Cute, "Love Berry Red" is the only fragrance I managed to snag out of their hard-to-find collections. 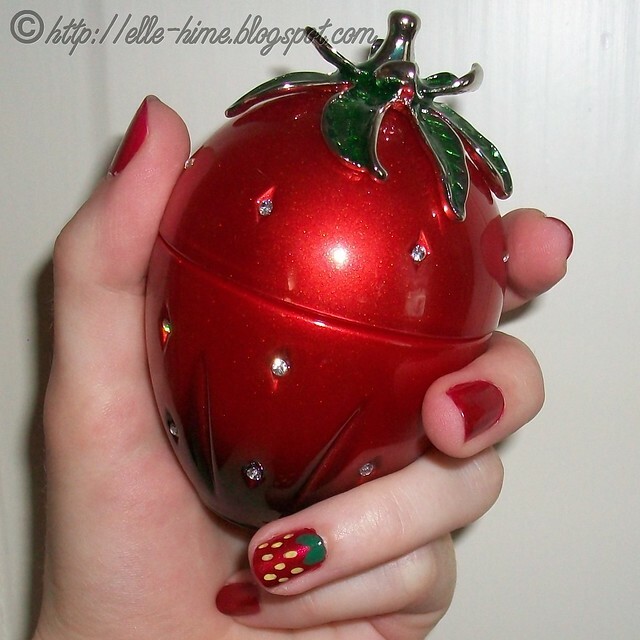 Searching for strawberry-smelling perfume, I was drawn in by the adorable bottle. There are other Love Berries in the line, with a color name and appropriately blinged-out bottle separating them from one another. This stock image was picked up from the S. Cute website. Their site doesn't provide much information, but you can learn that S. Cute stands for things like "super cute", "so cute", "shinning cute" or "splendid cute" ...yes, every page has a littering of Engrish. That or the company wants us to "Climb quickly up or down by gripping with one's arms and legs", and do it cutely. A fruity concoction with a foody, gourmand base. No wonder I was drawn to it! When you first spritz the scent you can smell the citrus top notes, but these do not linger for too long. You will also smell the berries! These are not purely the juicy, ripe berry smells of a fruit market, though. They have more of a strawberry candy quality. It must be from the sweet base notes mixing in. Lasting power is fairly good - I can still smell it on my skin hours later. However it is not a very noticeable perfume. Considering this kind of fragrance could quickly become headache-inducing if it were strong, I think it strikes the perfect balance. Love Berry Red is not a sophisticated fragrance. It's light, fun, and cute. Perfect for spring and summer, and leaning more towards daytime wear. I could also see this fragrance being easy to layer with other scents. This perfume didn't fully end my quest for pure strawberry bliss, but the scent is going into my Inventory, and I'll never let it go. Definitely going to keep the pretty empty bottle when that day comes. I really wish I could tell you where to find this, but I found my own bottle so long ago that I don't remember where it was. I wish these perfumes were more available, as I'd love to pick up a few of the other colors of Love Berry. If anyone gets better info on these lovelies please share it! Disclosure: I purchased this item myself and have shared my honest opinion.